Known for its trendy décor and uber hip guests, like country mega stars Faith Hill and Tim McGraw, Counting Crows, New Kids on the Block and a host of others, the hotel’s new rooms include the most up-to date finishes from top to bottom. The warm, residential tone is set with the addition of luxurious pillow top mattresses, crisp white bed linens dotted with colorful bed pillows; custom drapes and bold geometric carpet; sleek desk accessories; high-tech toys like 42-inch flat screen televisions and Wi-Fi connections; and new artwork and lamp fixtures. A vibrant and fresh palette of colors include: purple, orange, brown and green. A similar color palette accentuates executive and presidential suites, although each suite has a decidedly distinctive look. The renovation work, which has taken 4 months to complete, was overseen by Hotel Derek’s management company, Crestline Corporation, and is the first of many updates being made to the hotel. A new restaurant concept will be introduced in 2009, replacing Bistro Moderne. The hotel offers a broad range of packages for discerning travelers. Starting in 2009, those who relish a view from the top will delight in the hotel’s city-view rooms. Hotel Derek is a pet-friendly destination so bring your pooch or kitty for fun get-a-way! Hotel Derek is located at 2525 West Loop South. 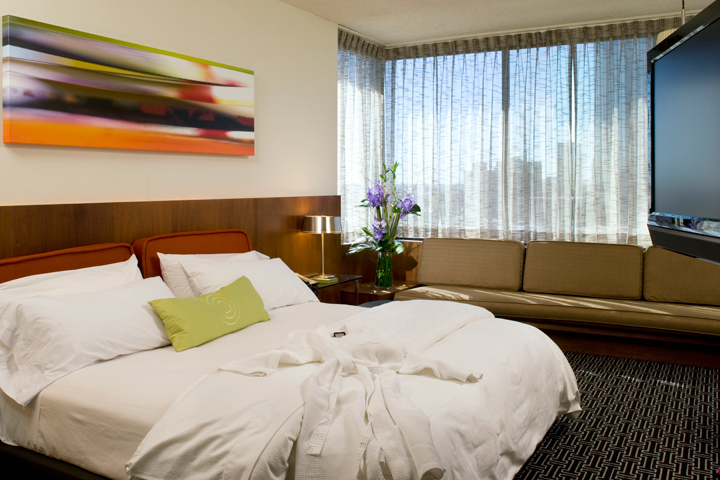 Room rates range from $289 on weekdays to $169 on weekends. Visit www.hotelderek.com for more information and special package rates for social, wedding, group travel or call 713-961-3000 for reservations.